This book analyzes the Group of Twenty (G20) since the 2008 financial crisis. The latter event undermined conventional wisdom and governance norms, constituting a more contested international economic regime. G20 leaders sought a cooperative response to the 2008 crisis through the forum, aware of their interdependence and the growing economic importance of key developing states. They agreed to new… norms of financial governance based on macroprudential regulation, the Basel III Accords, and enhanced multilateral cooperation. They prioritized G20 cooperation for achieving international economic stability and growth. Differences exist over causes and effects of the crisis, including on the merits of economic austerity or fiscal stimulus strategies; on responsibility for and solutions to international economic imbalances; and concerns about monetary policies and "e;currency wars"e;. 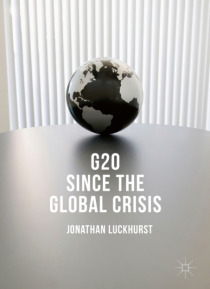 Despite claims from skeptics that G20 cooperation is declining, this book argues its importance for international relations and as a hub of global governance networks.